The Far Eastern Curlew Numenius madagascariensis is endemic to the East Asian – Australasian Flyway, is the largest migratory shorebird species in the world and is listed Endangered under IUCN criteria (IUCN, 2015). Recent evidence suggests that the Far Eastern Curlew has undergone a significant decline over the past 20 years. Drivers of this decline are likely due to habitat loss, human disturbance and possibly hunting. Successful conservation of this species requires urgent collaborative action across its full geographical range, including at breeding locations, at important migration stop-over sites as well as in non-breeding areas. At the Eighth Meeting of Partners (MOP8) of the East Asian–Australasian Flyway Partnership in Kushiro, Japan, Australia proposed the formation of a Far Eastern Curlew Task Force. Australia sought the commitment from all Partners, including all relevant government Partners, to cooperatively develop an International Far Eastern Curlew Action Plan. The Far Eastern Curlew Task Force was officially endorsed by the Partnership in January 2015. To restore the Far Eastern Curlew Numenius madagascariensis to a favourable conservation status and remove it from the threatened categories on the IUCN Red List. Encourage and support range states on the implementation of the Action Plan. Bio: Mark obtained his PhD at La Trobe University, Australia in 2011 where he examined the effects of investigator disturbance on the reproductive success of Short-tailed Shearwaters. He joined the Australian Government’s Department of the Environment in 2012 where he works on migratory species policy. Since joining the Department, Mark has had exposure to a wide range of international environmental agreements including Ramsar, CMS and Australia’s three migratory bird treaties with Japan, China and the Republic of Korea. Bio: Steve obtained his PhD in Animal Ecology. While an Australian Government Endeavour Research Fellow, he studied the behaviour of migratory Australian flying-foxes in a collaboration between The University of Queensland, Ulm University (Germany) and Cambridge University (UK). He has advised on wildlife conservation in corporate and government roles in an international context for more than a decade and is an expert with the IUCN Commissions on Ecosystem Management (CEM) and Protected Areas (WCPA). He joined BirdLife Australia in 2018. Steve works in the Conservation Team at BirdLife, where he coordinates the implementation of BirdLife Australia’s Conservation Action Plan for Migratory Shorebirds. Australia*, Bangladesh*, Brunei, China*, Fiji, Guam (to USA*), Indonesia*, Japan*, Malaysia*, Micronesia, Mongolia*, Myanmar*, New Zealand*, Democratic People’s Republic of Korea, Northern Mariana Islands (to USA*), Palau, Papua New Guinea, Philippines*, Republic of Korea*, Russian Federation*, Singapore*, Thailand*, Timor–Leste, Vietnam*. 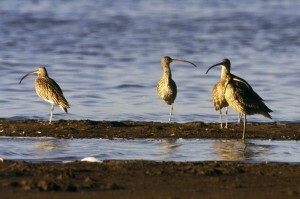 Click here for more information about the Far Eastern Curlew.